Welcome to Friday’s Frock and week 2 of Frocktober. In the spirit of Frocktober, I am featuring TWO fab frocks and this week’s theme is …. white frocks. I’m not talking bridal here of course, I am talking simple, drop dead fabulous frocks that are perfect for summer and require minimal accessories and styling. Don’t be put off by potential red wine spillages, grotty hands or “can people see my undies?” concerns – like their black BFF, the little white dress is a summer special. It’s not easy (or practical) to wear such a frock at other times of year, so when the sun is shining, this dress is good to go and makes a stunning but simple statement. The only accessory I do always wear with any white frockage is a bit of colour because I have a very fair complexion and I personally like the contrast of the white against a tan. This time, I’ve gone with the express 2 hour Moroccan spray tan option. That’s not a rule of course – when it comes to white frocks, wear it how you like it. I subscribe to the Different Strokes for Different Folks philosophy on this one. The first white frock is actually this month’s Style It Project piece. The Style It Project is a monthly style challenge which is the love child of Rachel of Redcliffe Style and Kim-Marie of Kimba Likes. I love it because they make a point of finding affordable, on trend pieces that can be worked and workshopped in loads of different ways. 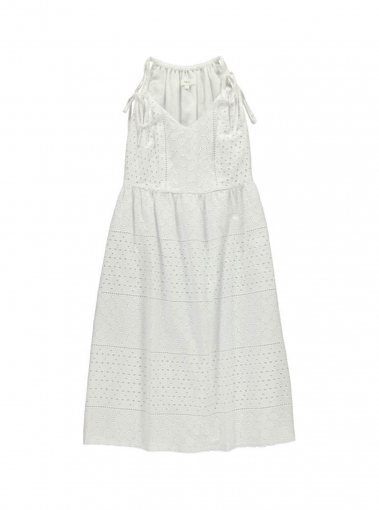 This month’s piece piece is the Eyelet Strap Dress by MIX Apparel (available online and at Coles), which is currently on sale for $29. This is a pretty, casual dress that is good value and is a fun, every day kind of frock. Below, I am pairing it with a pair of earrings from Hello Sailor Accessories and a faithful pair of tan block heels from Anthropologie. I am wearing a size 12. It was a little big in the bust (there really is a first time for everything!) but otherwise true to size. The waist seam is on the high side and my belt was a little wide to sit properly so I went without. It’s the sort of dress that looks good with or without a belt, depending on the length of your torso and where your waist sits. I also wore a strapless bra for this frock – it’s not strictly necessary but I wanted the strap detail to be a feature. The dress is lined too. I’d also wear this dress with flats and a cropped denim jacket or vest on cooler days. The second white frock of the week is a very Grease Lightening inspired prom dress which I could not go past at Forever New – the Diana Sweet Heart Prom Dress, $139.99. There is something retro about this frock and while I normally avoid a sweetheart neckline (which I associate with the 80s & 90s), I thought this dress was cute, fun and the neckline was balanced out by the full skirt. It’s a dress that could also work for the races, particularly Derby Day, paired with some black and white shoes/accessories. Even though I bought it only last week (in a 20% off storewide promotion), it is no longer available online. However, you can head in store or shop the white edit at Forever New here. I am wearing a size 12. Above, I am pairing it with a pair of earrings from Hello Sailor Accessories and a faithful pair of tan block heels from Anthropologie. What are your thoughts about white dresses? Are you a fan or find the very idea stressful? Found any fab frocks in your travels this week?